Mon., 4 Nov. - Wed., 20 Nov. Sun., 15 Sep. - Sun., 6 Oct. Sat., 2 Nov. - Sat., 16 Nov.
Wed., 6 Nov. - Sun., 17 Nov.
Fri., 6 Dec. - Mon., 30 Dec. Mon., 2 Sep. - Mon., 9 Sep.
Wed., 13 Nov. - Tue., 3 Dec. Mon., 9 Dec. - Sun., 29 Dec. Mon., 16 Sep. - Mon., 14 Oct. Sun., 29 Sep. - Mon., 7 Oct. Sat., 12 Oct. - Sun., 27 Oct. Tue., 1 Oct. - Thu., 31 Oct. Sun., 12 May - Tue., 11 Jun. Tue., 12 Nov. - Sun., 15 Dec. Mon., 16 Sep. - Tue., 15 Oct. Mon., 20 Jan. - Mon., 27 Jan. Sun., 2 Jun. - Sun., 22 Sep.
Fri., 25 Oct. - Wed., 27 Nov. Thu., 30 May - Sat., 29 Jun. Wed., 1 Jan. - Tue., 28 Jan.
See all 406 properties in Phnom Penh Intl. 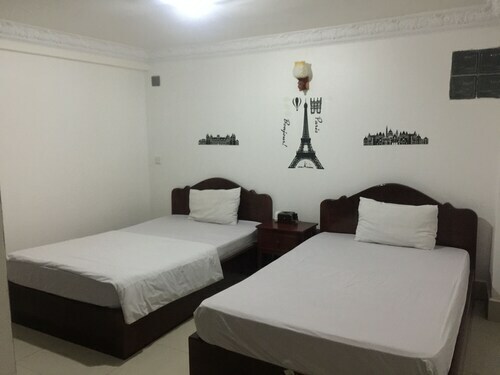 Located in Dangkao, this guesthouse is within 6 mi (10 km) of Royal University of Phnom Penh, Monireth Boulevard, and AEON Mall Sen Sok City. Wat Phnom and Phnom Penh Night Market are also within 9 mi (15 km). 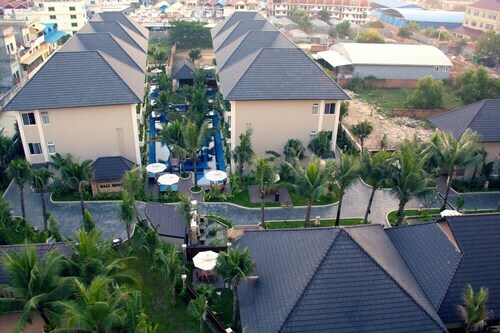 Located in Dangkao, this hotel is within 6 mi (10 km) of Royal University of Phnom Penh, Royal Cambodia Phnom Penh Golf Club, and Monireth Boulevard. Sovanna Shopping Center and City Mall are also within 6 mi (10 km). 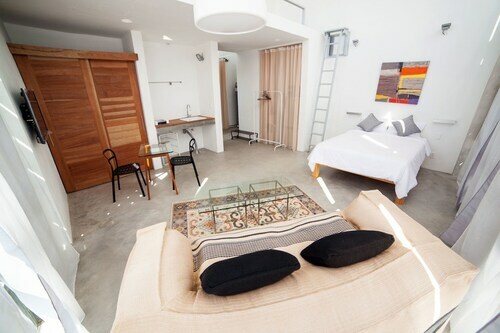 Located in Dangkao, this aparthotel is within 6 mi (10 km) of Royal University of Phnom Penh, Central Market, and Wat Phnom. Phnom Penh Night Market and Tuol Sleng Genocide Museum are also within 6 mi (10 km). Located in Dangkao, this hotel is within 3 mi (5 km) of Monireth Boulevard, Royal University of Phnom Penh, and Sovanna Shopping Center. Tuol Sleng Genocide Museum and Central Market are also within 6 mi (10 km). 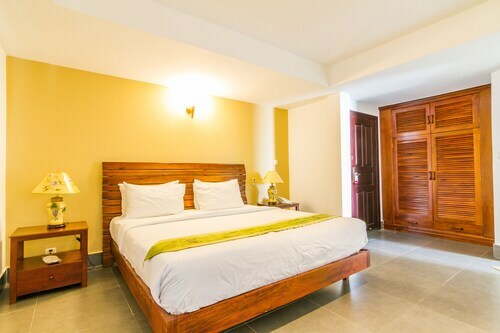 This family-friendly Phnom Penh hotel is located in the business district, within 3 mi (5 km) of Monireth Boulevard, Sovanna Shopping Center and Royal University of Phnom Penh. AEON Mall and Central Market are also within 6 mi (10 km). Located in Ruessei Kaev, this hotel is within 3 mi (5 km) of Monireth Boulevard, Royal University of Phnom Penh, and Sovanna Shopping Center. Tuol Sleng Genocide Museum and Wat Phnom are also within 6 mi (10 km). Located in Ruessei Kaev, this aparthotel is within 3 mi (5 km) of Monireth Boulevard, Royal University of Phnom Penh, and Sovanna Shopping Center. Tuol Sleng Genocide Museum and Independence Monument are also within 6 mi (10 km). Located in Sen Sok, this spa townhouse accommodation is within 3 mi (5 km) of Monireth Boulevard, Royal University of Phnom Penh, and Sovanna Shopping Center. City Mall is 3 mi (4.8 km) away. Answer : The cheapest day to fly from Toronto to Phnom Penh is on Tuesday. If you are trying to save some money on your next business trip look for flights on Tuesday. Question : What is the cheapest airline flying from Toronto to Phnom Penh? Answer : China Eastern Airlines is your best friend for finding that sought-after low fare. They offer fares as low as $862, while rates for similar flights are as high as $12,354. Question : How much is a plane ticket to Phnom Penh (PNH) from Toronto (YYZ)? Answer : Cost can range anywhere from $862 to $12,354, prices for YYZ to PNH do change much more than the majority of routes from Canada. However, usually the sooner you book, the better the price. Answer : You sure can adjust your departure or arrival date and you may save yourself some money by doing it. The lowest-cost day to fly in April is Tuesday. If you like to go with the flow, you may just find that you can pocket some money that you can use for future trips. Question : What is the cheapest date to fly to Phnom Penh? Answer : As of Apr 15th, the best day for booking to Phnom Penh (PNH) is Apr 18th. It cost $862, which is 52% below the average price to book the same route. Question : How much time do people spend in Phnom Penh? Answer : The average time spent hanging out in Phnom Penh by travellers from Toronto is 23 days.